(Nov. 27, 2018) -- While the construction of a new research facility will commence at the Downtown Campus next year, it’s not slowing down the UTSA National Security Collaboration Center (NSCC) from taking shape. Federal and industry partners are now arriving on campus to work with UTSA faculty and students. In 2017, UTSA welcomed ARL South Cyber, the S. Army Research Laboratory (ARL)’s corporate research lab to the campus. 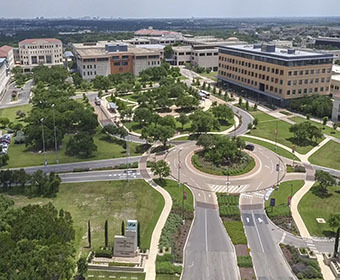 Two researchers – Ray Bateman, ARL South Cyber onsite Lead, and Kristin Schweitzer – have been embedded within the UTSA campus to facilitate research collaboration, and focus on all things cyber. IPSecure provides cutting edge cybersecurity to government and commercial sectors for a safer experience and better world. As San Antonio's largest cybersecurity provider, they pride themselves on innovation, offering security policy design to software development and everything in between. A nonprofit science, technology, and strategy organization, Noblis creates forward-thinking technical and advisory solutions in the public interest, with a wide range of government and industry clients in the areas of national security and intelligence, transportation and telecommunications, citizen services, environmental sustainability, and health.